Finish some secret Christmas sewing at our Sew-It-All Weekend Dec 7th-8th at our retreat center. Christmas sewing is in high gear over here - - I mean like, pedal to the metal! 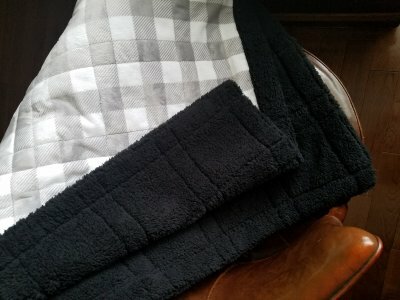 I just finished the softest buffalo check minky quilt backed in the most cuddly shearling as a gift for my husband. Unfortunately, he knows all about that little surprise because, well, how does one contain all that minky fluff? Especially from a quilt large enough to wrap that handsome fella in? So much fluff! It's all worth it though because he loves it. In fact, he visited me repeatedly while sewing to "pet" the fabric, asking me how long he has to wait until he can use it. He's going to have to wait till Christmas. Not because it's going under the tree but because I'm bringing it to the quilt shop so that everyone else can pet it too! We have a great selection of minky to chose from. Stop in and see how Ramona quilted this one quick with simple straight lines following the buffalo check pattern. 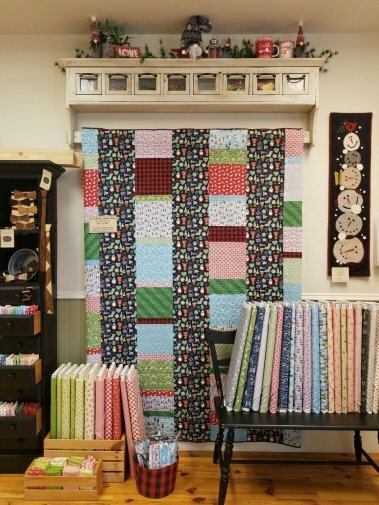 It's not too late to get your quilts in for machine quilting before Christmas! Bring in your finished quilt tops right away and we will help you work out all the details. That's one more thing you can check off your Christmas sewing list! 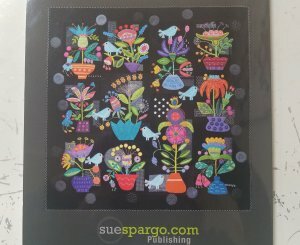 What else is on my holiday sewing agenda? I need to finish up a baby quilt for a new nephew, maybe throw together a few Bitsy Boxes and... a Bigfoot quilt for a special Sasquatch loving friend. How on earth will I get it all done and still enjoy the "peace of the season"? I plan to bring it all to our upcoming Sew-It All Weekend! It's a perfect chance to finish up some secret Christmas sewing away from those you are hoping to surprise. You can register here or at the shop for two full days of sewing at our retreat center this Friday 12/07 - Sat 12/08. $65 reserves your own work table and includes lunch both days as well as a Sew-It-All pass good for special discounts at the shop all weekend long! I can't wait to Sew-It-All with you and check those gift projects off the ever-growing to-do list. There's always something new to see in our wool department! Marianne Michaels has stitching fingers that never stop! This cute Woodland Visitors pillow is one of Norma Whaley's Bits and Bobs Designs. 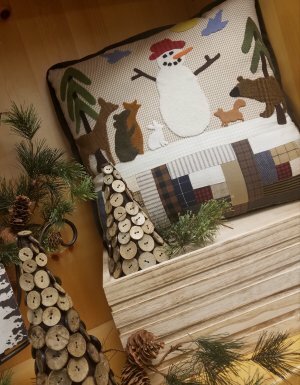 Hand-dyed wool applique forest friends gather atop pieced log cabin blocks to welcome winter. We have kits and patterns available at the shop to get you started on some winter stitching just in time for the snow to fly! Here's a little sneak peek of something else Marianne has been working on. Registration for this new wool block of the month club is now open! 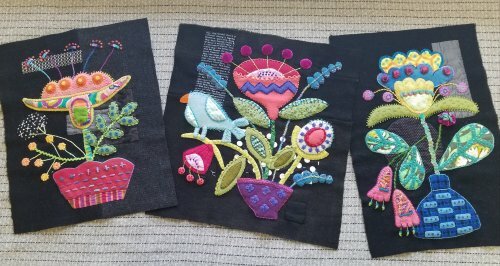 Vibrant blooms, leaves and berries sprout from unique vases and stand boldly against a layered black background in this wool applique masterpiece designed by Sue Spargo. Created with the hope of "brightening your days," you will enjoy surrounding yourself with vivid hand-dyed wool and adding details with a variety of unique embellishments. This 12 month club beginning January 2019 will include a monthly demo taught by Marianne Michaels here at the Corn Wagon, where you will learn techniques useful for completing each block. $34.99 due upon registration will include your first month's kit. This block of the month is a 12-month commitment. $34.99 will be due monthly as you pick up each kit. Shipping is available at an additional charge. No refunds given for cancellation. Kits will include wools for applique and cottons for backgrounds and binding. Fresh Cut pattern book and threads must be purchased separately. The Fresh Cut demo will be held the second Tuesday of each month from 3:00 - 4:00 and is optional but highly recommended. If you would like to stitch together with us, we invite you to join our It's all About the Wool Club which meets every second Tuesday 1:00 - 3:00, just prior to the demo so you can come and spend the afternoon with us! Register now for this block-of-the-month club by contacting the shop at 801-491-3551. It's beginning to look a lot like Christmas here at the shop! Shannon White put together the scrap-happy, fat-quarter Christmas quilt below using the 5 & Dime pattern by All Washed up. Look closely, you'll find Christmas gnomes, steaming hot chocolate mugs, winter-clad neighborhoods and sledding friends all with a Scandinavian flair. Emily Herrick quilted it perfectly with rows of loops and oh, that buffalo check binding... so fun! Kits available! Monday, December 3rd - 25% off MODA PRECUTS!